The GAGE'T was designed by professional woodturner Keith Tompkins in association with Giles Gilson. It is designed to measure the wall thickness of bowls up to 20" in diameter, or to the center of bowls up to 18". The GAGE'T can also be used for measuring the thickness of plates and platters. 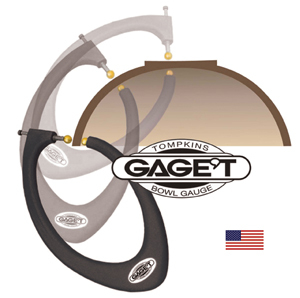 Made of urethane resin, the Gage'T has a spring loaded steel rod with lines etched around it that allows for direct reading in the wall thickness. Each line represents 1/16". The bowl being measured slides between two non-marring brass balls. The Gauge'T will measure the walls of bowls up to a maximum thickness of 2".